The WISMEC Luxotic DF Box kit is a new 200W powerful TC kit powered by dual 18650 batteries. Perfectly compatible with Guillotine V2 RDA, it will bring you an extremely strong vaping. Here comes the WISMEC Luxotic DF Box TC kit. It consists of a WISMEC Luxotic DF Box MOD with a Guillotine V2 RDA. Powered by dual 18650 batteries, the WISMEC Luxotic DF Box MOD fires up to 200W max output with advanced VW/TC modes. And it adopts the squonk system and equips a 7ml large capacity e-juice bottle for convenient refilling in anytime. Together with a large 1.3 inch display, easy-to-go user interface, spring-loaded 510 pin and 2A fast charging, the Luxotic DF Box kit will bring you a really simple yet strong vape. • Empty tank. You need buy e-juice separately. 200W WISMEC Luxotic DF Box TC Kit with Guillotine V2 Tank with Guillotine V2 RDA 7ml Bottle. 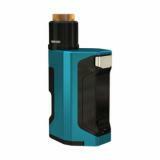 with Guillotine V2 will be a good choice for all vapers. 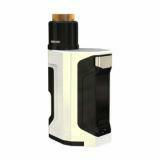 E-liquid capacity: 7ml; Cell type: high-rate 18650 cell; Output wattage: 1-200W; Resistance range: 0.05-3.0ohm. I am happy with purchase I want to say this mod is perfect. Its small. fits in the hand, paint is great. The stainless steal button is awesome. Im very pleased. Comes with 2 bottles.